I've been going to BEA of Book Expo America for the past few years. In many ways I've seen the show decline, especially with the abysmal third day last year. This year BEA was moved to midweek with only two exhibit days. I think this was a smart move for the show. Energy on the floor was higher than I've seen it the past few events and the pace was quite frantic at times. The aisles were especially clogged on Wednesday in not only the big publishers, but in nearly ever aisle I walked down. Great to see this. But I'm getting ahead of myself. On Tuesday I got in and had a lovely dinner at Crema in the West Village. I highly recommend this place. A very good laid-back atmosphere and delicious drinks. But it was the food I'll be remembering for weeks. I had their version of Peking Duck with mole sauce, which was outstanding and quite reasonable. After dinner my wife and I went to Madame X's for the Steam Salon hosted by Liz Gorinsky from Tor. I didn't get there until a little after 7 and was worried I would miss some of the festivities, but things were just getting rolling. [some links go to photos as mine didn't come out well] This was a great venue for the gathering. Something a little bigger might have been nice or a mic for the readers, but for the most part the readings went well. Before everything started I introduced myself to Cherie Priest who introduced me to Tor Steampunk aficionado Liz Gorinsky and Caitlin Kittredge. All three were quite nice and nicely costumed for the event. First up was Felix Gilman, who was much younger than I thought who did a short reading of The Half-Made World. I was in the back of the room so it was a little difficult hearing the quiet Brit, but what I caught was good. I also bought a copy of his Thunderer, which he signed for me and we discussed doing an interview. Next up was Catherynne Valente who was dressed up Victorian style with bustle and all. Catherynne was doing a reading from Deathless, which is her take on Steampunk coming from Tor in 2011. Quite intriguing. After this there was a brief break and I recognized Amber and Justin from Tor both of whom I've been corresponding with for a year now and we got to talking for a bit about this and that. I learned Dot is leaving Tor and we all shared sad faces. Up next was George Mann who enlivened the room a bit with his reading from his Newbury and Hobbes books. At this point my energy and that of my wife was waning so we dashed out back to our hotel before Cherie's reading. This was just the first night of falling down. Wednesday was the first exhibit day of the show. There were long lines waiting to get in, but pushing was at a minimum. Wandering around BEA is a bit of a trap. If you ever go make at least a loose plan of Publishers to visit and signings to go to otherwise you'll likely not get there. Don't forget comfortable shoes and bags with long handles to carry your booty. They give away loads of nice bags as well, but it's always best to come prepared. 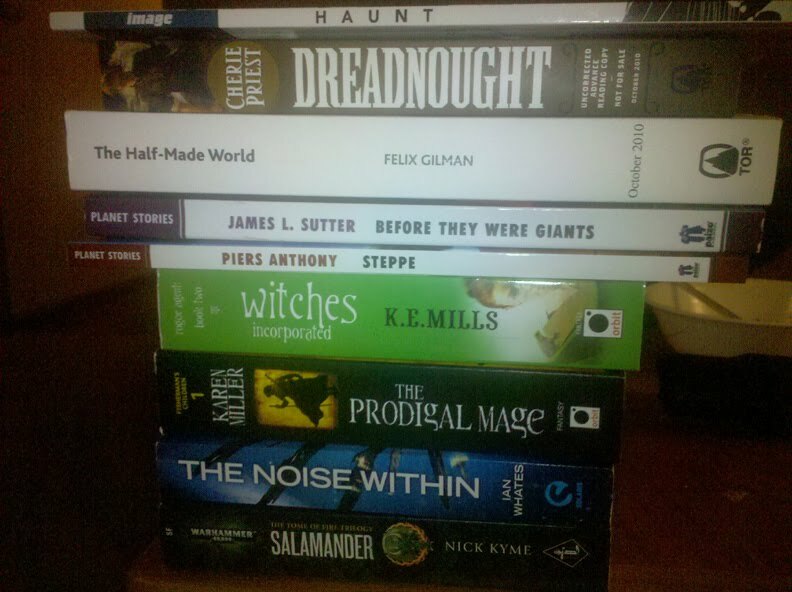 And I know this goes against usual logic, but don't grab every book you see given away. Decide if it is actually something you'd remotely be interested in before absconding away. There is probably someone else who'd enjoy that mystery more than you if you don't read any. I see so many people not even look at the title and throw it in a mountainous bag. First I stopped by some of the big publishers to see what they had laid out for the taking. My first find was Steve Martin's first full length novel An Object of Beauty that I hadn't even heard about. I greatly enjoyed his two novellas Shopgirl and The Pleasure of My Company. The Shopgirl movie is one of my faves. Martin is just as good at writing as he is at stand-up with moving and funny works. My wife and I had split up and when we met up again it turns out she grabbed a copy as well so we gave the extra to a friend we ran into. I grabbed a few more galleys all of which are noted below and than I was off to Gilman's signing of The Half-Made World. Cherie Priest was signing Dreadnought immediately after he finished so I wandered over to one of the author stages to kill time where a YA panel on Paranormal Fiction was going on with Richelle Mead, Holly Black, Ivy Devlin, and Andrea Cremer. It was a good discussion marred by some technical difficulties at the start, but I had to leave before it was over to get in Cherie's line, which by the time I got there was past the roped area. When I was finished it was still just past the ropes and they ran out of books before her allotted hour was up. Goes to show you that being early is important for those must have books. Cherie is definitely going up in the world. After the signings I went by some of the genre publishers to see what they had going on and to say hi to a few people I correspond with. I also stopped by Graphic Novel row where Todd MacFarlane was signing The Haunt. Thursday was a bit more sedate in terms of people, but it was still pretty busy. A friend of mine came in to wander a bit with me, which was nice. Hopefully this friend will get their stuff together this summer to start doing some reviews here - that means you Vapor. I went to Karen Miller's signing and said hello to Alex from Orbit while there. We kidded for a minute about the next cover kerfuffle I'm likely to start. Than I was on to the Joshua Braff signing for his second novel Peep Show after his The Unthinkable Thoughts of Jacob Green, which showed great promise. I stopped by the Steampunk panel with Cherie, Catherynne, and Felix for a little bit, but had to move on to meet-up with friends. They were shooting the panel so hopefully it will be online in the coming weeks. After that I stopped by the Games Workshop booth where Nick Kyme was signing one of his Warhammer novels. Next I tried to go back to the Graphic Novel area for a Garth Ennis signing and found out it was the day before. Oh, well. But I did happen upon the Paizo booth and talked with the publisher for a moment and he gave me a copy of the anthology Before They Were Giants even though they weren't giving them out. After that I lost steam quickly and headed home with my two bags full of booty. Below are pics of what I grabbed and the usual info. Haunt by Todd MacFarlane - This autographed and from what I've heard so far so basically MacFarlane continuing his venom stuff. Dreadnought by Cherie Priest - Autographed by the very kind Cherie. I must get to this soon. The Half-Made World by Felix Gilman - Gilman's Steam-Western, which had me even more intrigued after his short reading at the Steam Salon. Before They Were Giants edited by James L. Sutter - This is a collection from Paizo of the first published stories from well known authors such as China Mieville, Ben Bova, Greg Bear, Kim Stanley Robinson, William Gibson, Cory Doctorow, and many, many others. Plus after each story there is a small interview with each discussing where they were in life and also if they would change anything about the stories if they could. Steppe by Piers Anthony - This also came from Paizo as part of their Planet Stories line of reprints. Witches Incorporated by K.E. Mills - This is autographed from Mills aka Karen Miller. The Prodigal Mage by Karen Miller - Even though I have the hardcover I had to get an autographed copy. The Noise Within by Ian Whates - I never found the Solaris booth, but my friend snagged me a copy of Whates' novel. Salamander by Nick Kyme - Warhammer here I come. 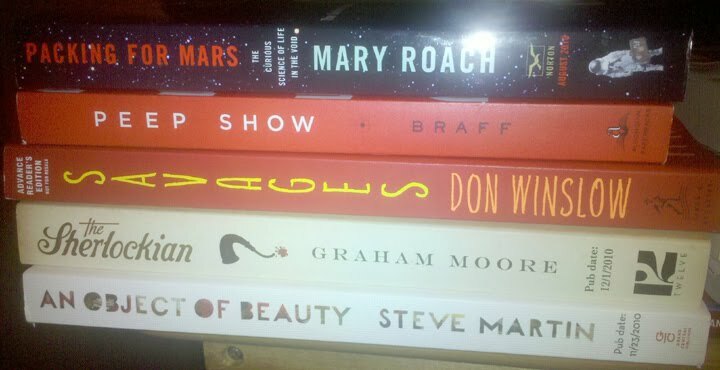 Packing for Mars by Mary Roach - If you didn't enjoy Roach's Stiff than something is wrong with you. The follow-up Spook wasn't as interesting, but I'm more than willing to give this a shot. I opted to take the book and run instead of waiting in the 150+ long line. Peep Show by Joshua Braff - This is Braff's sophomore effort, which I'll probably read over next vacation. Great cover. I got it autographed. Savages by Don Winslow - This was the much ballyhooed crime novel of the fair and the copy sounded interesting. The Sherlockian by Graham Moore - The lost journal of Arthur Conan Doyle. This has the propensity to be really good or truly bad. Time will tell. An Object of Beauty by Steve Martin - The biggest find of the show. My wife will start in on it first though. She was a big Shopgirl fan. Word on the street is Book Expo will be going back to 3 exhibit days next year. Now I go and fall down and rub my feet.